This one-day workshop shows participants how to apply the structure of a business case to change management and provides a method and tool for demonstrating the ROI of change management. Change management practitioners are often required to justify the appropriate level of investment in change management - this course is designed help them do so. This programme is only available to certified Prosci Change Management Practitioners holding a valid license to use Prosci Pilot Pro (pre-2015) or Prosci e-Practitioner (post 2016) toolkits. Participants should be currently engaged in the change management activities on a defined and active project where adoption and usage of the new solution, by directly impacted employee groups, is critical to the achievement of the business results expected from the project. A completed one page 4Ps project summary detailing Project Name, Purpose, Particulars and directly impacted groups of People must be submitted as pre-work, together with confirmation of the two largest challenges with the project at this point in time. Refresh their knowledge and ability to effectively use Prosci’s structured approach to Change Management, Best Practices Research, methodologies and tools for effective change management. Refresh how to apply ADKAR and Prosci’s 3-Phase process for organisational change to their project. Note: This section is taught using the Prosci 2017 Practitioner e-toolkit and materials. It is therefore recommended that participants contact Prosci and upgrade to the 2017 Practitioner e-toolkit license prior to attending this workshop. Current license upgrade charges are in the region of US$400 depending upon the version you are upgrading from. Are introduced to the new Prosci ADKAR Map to help them establish a roadmap of change management activities and milestone measures by impacted group, relevant to their change, up to the point of “Go-Live” for their project. 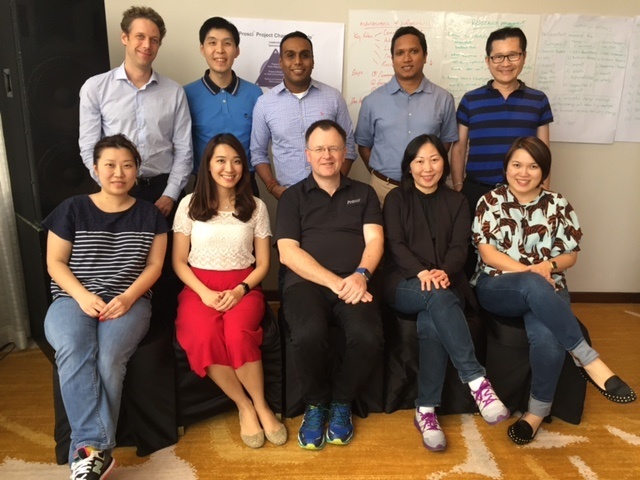 Are guided by the CMC Prosci Advanced Instructor to discuss and review up to four critical challenges from those submitted by participants in pre-work, in separate time-boxed sessions. How to structure the business case for investing in the right amount of change management for my project? How to best apply the Prosci methodologies and tools end to end in my project? How to best integrate my change management activities with the project management function? How can I use my project as a foundation for establishing enterprise change management competency more widely in my organisation? How can I determine the best set of measures and metrics for the people side of change in relation to my project? How can I build the best Sponsorship coalition for my change project? How can I successfully reinforce, recognise and reward the progress and results of my change project? How can I build the best Resistance Management plan for my project? Refresh their knowledge and ability to effectively use Prosci’s structured approach, Best Practices research, methodologies and tools for effective change management. Refresh how to apply ADKAR and the Prosci 3-Phase Process change management methodology to their project.